When we first began traveling to Paris as a family, we were somewhat overwhelmed by what to do with our children in the city. We have now visited Paris multiple times and have even lived there with our children. This is a summary of our favorite places and spaces in the beautiful City of Light. 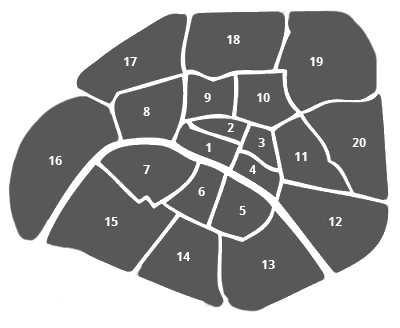 I have grouped each site by arrondissement (district) and indicated the ages that I think would most enjoy it. Things change quickly in this magical city, so it is always best to check online or call ahead to ensure things are still the same as described below. And, be sure to check out A BONJOUR for more information and ideas on how to create a good day in Paris! Select an arrondissement (district) on the map below for a list of our favorite places and spaces. Probably the most famous attraction in the 1st arrondissement is the Louvre. To avoid long lines at the main entrance, it is best to enter the museum via the Carrousel due Louvre. This underground shopping center lies west of the museum off of rue de Rivoli. You can buy tickets ahead of time (check out the museum website for more information). The museum is open every day except Tuesday. Prime times to visit include Wednesday and Friday evenings when the museum stays open later. You can even get a taste of home with the American style food court in the Carrousel due Louvre that offers a variety of kid-friendly meals (and easy to access restrooms). This beautiful garden has plenty of wide-open walking paths for everyone to stretch their legs. There is a play structure for toddlers and younger school-age kids. Often during the summer months, there is a carnival with games and rides in the Tuileries Garden near rue de Rivoli. The outside cafés in the garden are a nice place to grab a bite to eat or a refreshing drink. The best gelato store in Paris, Amorino, often sets up a temporary stand in the garden during temperate weather. This museum houses eight of Monet’s enormous Nymphéas (water lilies) paintings on the main floor. Kids are often awestruck by the sheer size of these works of art. The basement has a mixture of works by famous artists including Cézanne, Renoir Matisse, and Picasso. Being a fairly small museum, you can get in and out in under an hour. If you run out of reading material, WH Smith has English books for you and your kids. It is just across the street from the Tuileries. This stunning and historical bookstore offers literature in English for all members of the family. Their beautiful coffee table books are worth a quick stop. Known for its savory hot chocolate, it is rumored that Coco Chanel frequented this tearoom for the sweet beverage every day. And, having been in business for well over a century, its’ décor in the Belle Époque style is reminiscent of a time long ago. The hippest store in town! Colette is a cutting edge concept store that has some of the most fashion forward clothing and accessories. It also has cool books and gadgets that older tweens and teens might like to check out. You can find designer clothing, make-up and perfume on the upper floors. A fun café to sit and watch the “beautiful people” on rue Saint-Honoré. No website at this time. Trendy bar with music mixed by famous DJ Stéphane Pompougnac. Founded in 1853, Maison Goyard claims to be the oldest trunk maker in the world. All crafted in France their beautiful bags are seemingly indestructible and come in a variety of colors. Customizable options include stripes and initials of your choice. The most beautiful (and pricey) children’s clothing you may find in Paris, Bonpoint truly captures the essence of French style for children. There are other locations throughout the city including an outlet in the 7th arrondissement. Scattered throughout Paris and around the world, this restaurant offers a healthy French breakfast and lunch menu that should appeal to most everyone. Wine bars are relatively new to Paris, so it is not surprising that an American couple started Verjus. They also have a restaurant, but the wine bar is perfect for a quick apéritif before heading out to a more traditional French dinner. If you have someone in your family who adores crafts, be sure to check out La Drougerie. They have an assortment of beads, buttons and baubles. The Palais-Royal has a small but beautiful garden. Arcades surround the grounds with lovely shops and galleries. If you are looking for a special scarf or wrap from Paris, it might be worthwhile to check out Épice. It is a bit pricy, but they carry the most amazing designs. Les Deux Plateaux, a modern art installation, (otherwise known as the Colonnes de Buren) is a must see. It is tucked away in an inner courtyard (Cour d’Honneur) just south of the Jardin du Palais-Royal. The graphic black-and-white striped columns created in 1986 by Daniel Buren in varying heights are whimsical (and probably even more amusing to kids who are sure to have fun playing among them). During the months of July and August the city actually trucks in sand to create a few beaches on the right bank. There is usually a plage near the Louvre along the Seine. les Berges is a recently opened promenade along the left bank of the Seine. During the summer, there are multiple activities from checkers to yoga, along with several outside dining options. Check online at Paris Plages and les Berges for specific dates, locations and activities. Note that Sainte Chapelle is technically in the 1st arrondissement, but since it is so close to Notre Dame more information can be found in the section on the 4th arrondissement. If you find yourself in the 2nd arrondissement, a walk down Rue Montorgueil is always fun with its year-round market. You may find some of the best meat and fish markets in Paris here. Diverse and worldly flavors spice up this market with a sort of old-fashion food court feel and a variety of food vendors from around the world. It is reportedly the oldest covered market in Paris. The hours are pretty varied, so check online to verify operating hours, particularly during the summer months. A sweet little park that can offer the whole family a quick break from the busy streets of the Marais. Depending on the ages of your children (and your comfort level), you might be able to let the kids hang out in the park while the grown-ups grab a drink at the café just across the street. Marie France Cohen founded the quintessential children’s clothing store Bonpoint. After selling the store she decided to open a shop called Merci and donate much of the profits from Merci go to charity. This much-talked-about store sells a whole range of products from kitchen gadgets to high-end woman’s clothing. There is usually an old bright red Fiat parked in the courtyard in front of the store providing a fun photo opportunity. Typically, the store’s entrance is decorated with seasonal products in an art-like installation (e.g., umbrellas in the spring, biking accessories during the Tour de France). Just down the street from Merci, Marie France Cohen’s son Thomas and his wife opened Bonton. The store carries beautiful (and wearable) children’s clothing, accessories and toys. There are several locations for Bonton (including an outlet in the 7th arrondissement). Keeping it all in the family, just a hop, skip and jump from Merci and Bonton, Marie France’s son Julien opened the wildly hip pizzeria called Grazi with a very cool bar. This English bakery offers an array of healthy food options with a second location in the 9th arrondissement at rue des Martyrs. No website at this time. Cream puffs à la française! There is a second store in the 9th arrondissement. A boulangerie where its delicious bread is cooked in a wood-fired oven. Be sure to try their punitions (butter cookies). They additional stores in the 6th and the 15th arrondissements. Cuisine de Bar is a smart choice for lunch in Paris. Their reasonably “priced-fixed” lunch includes a variety of tartines (open faced sandwiches on Poilâne bread), a small salad, and a beverage of your choice (including wine). Don’t let the line out the door scare you, it generally moves at a decent pace. There is a second location in the 6th arrondissement at 8, rue du Cherche-Midi, 75006. There are number of trendy boutiques in the area around Rue Debelleyme such as Les Prairies de Paris, Virginie Castaway and French Trotters. It is a fantastic area to explore and you are guaranteed to discover things that you wouldn’t find in any guidebook. Place des Vosges is one of the most picturesque squares in Paris with some decent play equipment for kids. It is one of the few parks where picnicking on the grass seems to be tolerated. The arcades surrounding the park make for a great spot to cool down on a warm day. Conveniently located off the Place des Vosges is the former home of Victor Hugo with free entry to all visitors. The apartment has an interesting display of traditional 1800’s furniture and décor. At one point, Europe’s largest Jewish community lived in this area, but a substantial percent of the population died during WWII. There still remains a small number of Jewish residents that live in the neighborhood today, so you can still find traditional delis, bakeries and restaurants on this street. There are a number of restaurants where you can find delicious falafel in the Marais. Any restaurant with a line tells you the food is bound to be good. Falafel is an enjoyable option for lunch on Sundays when many restaurants are closed in Paris. Our favorite is L'As Du Fallafel at 32-34, rue des Rosiers, 75004 (no website at this time). These are some of the major shopping streets in the Marais. If you would like to shop on a Sunday when most shops are closed in Paris, head to the Marais. Home to the famous K. Jacques sandals, you can buy a pair off the shelf or order a customized pair. Set in a lovely courtyard, this shop not only offers the most adorable fabric, ribbon, and notions but also boasts an amazing button selection. Pamela Popo is a cool and hip restaurant for Sunday brunch (although it does not open until 1pm on Sundays). Best to call for reservations, but most of the staff speaks English. You can’t judge a book by its cover! Kids may have a hard time believing that this high-tech looking building is a museum, but it is! With its large modern art collection, this museum is a pleasant break for kids from the abundance of Impressionist art in Paris. The restaurant on the top offers amazing views of the city, but is probably best for families with school-age kids during the lunch hour and grown-ups during dinner. This store has it all, from fire extinguishers to bathing suits. If you come to Paris and find that you’re missing something (e.g., a missing stroller screw) and don’t know where to find it, head to the BHV. The store offers a large selection of toys, art supplies and children’s clothing. There is a cafeteria-style restaurant on the top floor that usually has children’s meal options. A must for tea connoisseurs! You can sample their many varieties in the tearoom or just head to the shop next door and spend hours smelling their most exquisite blends. One of my favorite souvenirs is their music box that not only has a drawer for their Madame Butterfly tea but plays a song from the opera. Although you can still find some true “bouquinistes” (used and antique booksellers) along the Seine, many of the stalls today sell the usual assortment of souvenirs as well as books. Although Sainte Chapelle is technically in the 1st arrondissement, it is just on the border of the 4th arrondissement. Sainte Chapelle was once home to a piece of Jesus’ crown of thorns and a bit of wood from his cross. Today, the magnificent stained-glass windows are worth a visit. There is usually a line to get into Sainte Chapelle, but it generally moves quickly and can be toured in less than an hour. It doesn’t seem possible to visit Paris without a stop at Notre Dame. However, if the line is incredibly long to get inside, save it for another trip and savor the beauty of the outside. There is a small park behind it with play equipment. Who knew there was an archaeological crypt underneath Notre Dame? It has remnants of buildings that were constructed between the Gallo-Roman period and the 18th century. A visit to the Crypte is quick and fascinating. This flower marché is just a few blocks from Notre Dame and is transformed into a bird market on Sundays that kids are likely to enjoy. This small island is home to the famous Berthillon ice cream. Rue Saint-Louis en l'Île is lined with several locations that sell the ice cream as well as numerous boutiques. This traditional bistro on Île Saint-Louis is an easy place for lunch for the entire family. A large botanical garden with open walking trails and a small (but fun) labyrinth just off of rue Geoffroy-Saint-Hilaire—on the west side of the park. The museum actually consists of four galleries on the grounds of the Jardin des Plantes. The Galerie de Paléontologie et D’anatomie Comparée (Gallery of Paleontology and Comparative Anatomy) is incredible with a large number of species, housed in a gorgeous, timeworn building. Even if skeletons are not your thing, you will appreciate the French sense of style that has been applied to the exhibits. Just a block or so from the Jardin des Plantes sits this pasta restaurant with a menu of healthy, homemade pasta. Rue Mouffetard is an older street market with fruit and vegetable vendors, fish and meat markets, and fromageries. La Place Contrescarpe has a satisfying variety of restaurants most of which are likely to welcome children. Just down the street, Hemingway lived at 74, rue du Cardinal Lemoine. Arènes de Lutèce is an open arena where long ago gladiators fought lions. If you look closely, you can still see where the cages were that held the animals. Today it is the perfect space to kick the soccer ball around or play pétanque (bocce) ball. There is small playground behind the arena with two small play structures. Piscine Pontoise is a public swimming pool that was built in the 1930s and has retained its Art Deco décor. In general, everyone is required to wear swim caps in Paris. In addition, boys and men are not allowed to wear swim trunks but they do typically allow the longer cut speedos (like biking shorts). Fortunately, most pools sell swim caps and speedo-style suits for boys and men in vending machines in their lobbies. If the kids (or you) can’t live without chips and salsa, get your Mexican fix here while in Paris. Hankering for a grown-up cocktail? Check out this swanky French style lounge for a drink or two. The museum of the middle ages might be of interest to older kids, particularly the early Medieval sculptures . Be sure to check out the remains of Roman baths dating back to 200 AD. It is certainly one of the most beautiful parks in Paris with its formally landscaped gardens. Be sure to rent one of the small toy sailboats and let the kids direct it around the Grand Basin with a stick. There are plenty of wide-open trails for walking and running and benches and chairs to relax on. The park has a large playground that will entertain even tweens. Although there is a small fee to enter, the playground is well worth it. This small bistro style restaurant definitely feels French. It can be tricky to get a dinner reservation, but a meal at lunchtime is just as satisfying. If you’re feeling a little homesick for American style food, here is an eatery where you can get milkshakes, bagels and even Sprite, along with a number of other American style meals. There is a second restaurant in the 16th arrondissement. Pizza does not get more chic at this pizzeria! Le Bon Marche is the oldest department store in Paris with a large range of luxury brands. If high-end clothing does not appeal to you, they have a wide selection of perfumes and accessories. In addition, they have household items such as bedding as well as children’s clothing and toys. The store has a Rose Bakery where the people-watching is at its best. A grand food hall of fresh, prepared and packaged food. Where else can you find a whole wall of fashionably displayed drinking water? Pick up some “foodie” souvenirs to bring home at this elegant grocery store. This chic shopping street in the 6th arrondissement has a few of the popular French brands (Comptior des Cotonniers, Cotélac, and a Maje outlet) and some smaller boutiques. Drop in to the Poilâne Bakery for lunch and then let yourself meander in either direction as you will surely bump into something that tickles your fancy. These two cafés are known for their famous literary patrons (e.g., Hemingway) during the post WW II years. They are fun to take a peek at least once even if just to say you have been there. If you have your kids in tow, head out just a few blocks to the ever chic rue de Bucci and have your café crème at Paul (77 rue de Seine). Although a French café chain, Paul offers appealing food and drinks. Sprinkled throughout Paris, Paul’s makes it simple to grab a sandwich for a picnic in the park on a sunny day. It’s all about the steak sauce at Relais de l'Entrecôte. The secret recipe has top chefs trying to guess its ingredients. Keeping to what they’ve perfected, this restaurant provides a set menu of salad, steak, fries and dessert. The only choice you really get is how you want your meat cooked. It is good for kids and big groups, but get there early as a line forms quickly. It opens at 7pm, so arriving by 6:30pm is a must, unless you want to wait for a later seating. There are two other locations in the 8th and 15th arrondissements. La Dernière Goutte is a delightful wine shop where you will probably find some English spoken. The museum is housed in the former Gare d'Orsay, a Beaux-Arts railway station built in the late 1800s. The museum displays mostly French art dating from 1848 to 1915 with the largest collection of Impressionist and Post-Impressionist masterpieces in the world. The lines can be long, so buy tickets online, ahead of time. Le Cinqu Mars is a small, intimate restaurant near Musée d'Orsay with retro décor and tasty food. Bonpoint Fin de Séries is an outlet store for the lovely Bonpoint clothing. If you like their clothing line then just head east on rue de l'Université, and you’ll run into more (full-priced) Bonpoint stores including YAM which sells clothing for tweens, teens and moms. Although a little tricky to find, the Sewer Museum is worth a stop if you are in the 7th arrondissement, near the Seine. It’s a bit smelly, but doesn’t take long to tour and kids might find it to be a “refreshing” break from the art museums in Paris. A personal favorite out of the trio of Christian Constant’s restaurants that you can find on rue Saint-Dominique. Just about every dish (including dessert) is served in a cast-iron Staub cocotte. Although you have to be a member to access the library, day and week-long memberships, without check-out privileges, are available. Head there to read the newspaper, take advantage of their WiFi or catch a story time for younger school-age kids. It is hard to image visiting Paris without at least one visit to the Eiffel Tower, which is why it can get quite busy. If you decide to go, be sure to buy your tickets in advance online. Consider visiting this monument at night, as it is less busy during the evenings and its lights are turned on to sparkle, on the hour once it gets dark—a very magical experience. The Champs de Mars is the large and plush lawn behind the Eiffel Tour. Nothing beats picnicking in this park on a pleasant day or in the early evening. Rue Saint-Dominique is a shopping street that intersects rue Cler (the market street that Rick Steves made famous). There is a Starbucks on rue Saint-Dominique if you are in need of a taste of home, but if you’d like to explore a little French culture there are at least two decent boulangeries if you keep heading east on the street. Be sure to peak in the window of Aux Merveilleux De Fred to see the prettiest meringues in Paris (94, rue Saint-Dominique). This museum is dedicated to works of the French sculptor, Auguste Rodin. Some of his well-known pieces such as The Thinker and The Kiss can be seen here. Many of the sculptures are displayed in a beautifully landscaped garden, allowing kids the opportunity to be outside while appreciating art. The outside café offers guests a lovely space to eat lunch on a pleasant day. The national military museum contains over 500,000 artifacts from weapons to uniforms to paintings. The tomb of Napoleon can be found in the Dôme des Invalides (which is part of the Musée de l'Armée, but can only be seen from afar). Adorable clothing for younger kids, often in grown-up colors (e.g., black and grey) with locations in the 1st, 6th and 16th arrondissements as well. A beautiful restaurant with a large terrace and extended hours (10am to 2am) that make it a relaxed spot for lunch, an afternoon snack, or late-night dinner. If the weather is agreeable, ask for a table outside. It is great for a bigger group. This street has all the large international stores. If you want to say you have visited it, walking just one block of it is enough to give you a taste of its flavor. The views from the Arc de Triomphe make it worth the fairly significant hike up and down. The line for tickets usually moves quickly. A truly elegant park with a playground and lounge space for picnics. Not only is the opera house gorgeous (and just a stone throw’s away from the grand department stores), but it has an intriguing history. The lake—which is actually a water tank—served as inspiration for “The Phantom of the Opera.” If you search online you’ll find quite a number of tales about it, such as people fishing for trout or firemen swimming in the water tank beneath it. Needless to say, a guided tour of the opera house is well worth the money. Shopping and more shopping can be had at both these large stores. If shopping is not your thing though, Galeries Lafayette has an amazing stained-glass ceiling that would be worth just a quick peek look to see it. A pleasant café just a block away from the grand department stores. Who can resist a shop that sells over 100 different jams? They also offer chutneys and a multitude of savory options. There is a second store in the 3rd arrondissement. A pâtisserie that is so pretty that the shop doesn’t look real. With a spattering of several restaurants and cafés along its banks, a walk along Canal St. Martin can be quite charming. Consistently in top restaurant lists—with one ranking landing it in the top 50 in the world—you’ll find nothing but raving reviews for this eatery. Despite its high ratings it is fairly casual and affordable (with a price fixed menu). Le Dauphin is the wine bar just a door down the street (131, avenue Parmentier). This casual, foodie restaurant in the 11th arrondissement has a dinner menu that offers a variety of small plates of only the freshest market ingredients. Beautiful and unique, this landscaped urban walking trail was built on an abandoned railway. The Promenade Plantée is an extensive green belt that follows the old Vincennes railway line. Beginning just east of the Opéra Bastille it follows a 4.7 km (2.9 mi) path eastward. An enormous, open space just east of Paris with acres and acres to walk, run, and relax with a number of snack bars throughout it. The park contains the Château de Vincennes, a former residence of the Kings of France; an English landscape garden with four lakes; a zoo; an arboretum; a floral garden; a hippodrome or horse-racing track; and a velodrome for bicycle racing. A park with a number of kid oriented activities (e.g., miniature golf, zip lines, pedal cars, puppet shows). Some of the activities do charge fees. A flea market on Saturday and Sunday mornings from 7am to 1pm where everyone is sure to find some sort of treasure. With about 350 merchants, it’s fairly easy to navigate in just a few hours. The prices are reasonable and there is a charming selection of smaller items that are easy to pack and take back home. (Note: most merchants take cash only). After checking out the Eiffel Tower, head north over the Seine River to Trocadero where you’ll find amazing views of the city and the Tower. The plaza is an excellent location for photos with the Eiffel Tower in the back-drop. On the east side of the Trocadero is an architecture museum. Not only can you see models of French architecture and actual monuments, but some wonderful views of the Seine and the Eiffel Tower. The museum has a cafeteria-style restaurant. Head just a bit farther into the 16th arrondissement to the north side of the Trocadero where you can pick any one of the cafés that line the street for another Eiffel Tower viewing opportunity. Visit one of the cafés at night and sit outside for a prime view of the sparkling Tower show. The Président Wilson Marché is open on Wednesdays and Saturdays from 7am to 2:30pm. It would be hard not to admire the wide variety of fresh fruits, vegetables, cheeses, fish and meats. There are usually a few stalls that sell jewelry, leather goods and gadgets. Monsieur bleu is a newer restaurant in the recently renovated Palais de Tokyo (contemporary art space). Savor some superb views of the Eiffel Tower with an early evening apéritif in their posh, but comfy bar. Rue de Passy is a shopping street that offers all of the French brands, without the tourists. If the whole family is with you, a typical French brasserie lunch or dinner at Aero in the Hotel Aero is family-friendly option. Antiques are hard to find these days in Paris except at very high-end stores or flea markets, so it was very exciting to stumble upon this store. Allow yourself enough time to dig around and you will not leave empty handed. No website at this time. Just a short bus or metro ride from the Arc de Triomphe, Gus is an adorable restaurant that serves both sweet and savory crepes. The décor is kitschy (in a cool way) with plush red seats and vintage inspired mercury glass lights. No website at this time. Although a smaller-sized museum, Musée Marmottan Monet has an impressive Monet collection and is easy to navigate with kids. This park is quite close to the Musée Marmottan Monet and offers some sizable grassy spaces for kids to play. Some days you might be able to find some small amusement rides as well ponies in the park. Bigger than Central Park, the enormous grounds include gardens, several small lakes and even a horse racing track. Within the Bois you’ll find the Jardin d’Acclimatation, a fun amusement park and zoo. Unfortunately, there is a bit of “seedy” activity that takes place in the park. As long as you stay away from the deep-forested parts, you are not likely to run into any problems though. It is well worth the trek up the hill to see the beautiful Sacré-Cœur Basilica nestled into the quaint streets of Montmartre. Place de Tertre once hosted a number of famous artists, but today it is artists looking to make money off of tourists. Nevertheless, it is fun (and can be fairly fast) to have your child’s portrait done there. The Square Marcel Bleustein-Blancehet park has a small playground and lies northeast of Sacré-Cœur (just off of rue de La Bonne). If you cannot make it to a flea market in Paris, check out this store for some French treasures to take back home with you. No website at this time. Sitting just behind Sacré-Cœur Basilica, this restaurant gives visitors a cozy, casual option for dinner or lunch. If the lines seem daunting, consider just exploring the immaculate gardens outside; kids like walking (and as allowed running through them). Or, rent bikes and cycle your way through the gardens of the Chateau. Tours are a wonderful way to see the city. Most kids love the boat tours along the Seine. And, the Fat Tire Bike Tour is an excellent way to see major sights in Paris, but it is recommended for tweens and teens (as you are biking in Paris traffic a few different times during the tour). Picnicking in Paris is the best! Although you are not allowed to sit on the grass in many parks, there are still countless other spots to picnic. Grab a seat on the grass of the Champ-de-Mars, along the edge of the Seine or on one of the pedestrian bridges such as the Pont des Arts. For a simple lunch just pick up sandwiches at a nearby boulangerie or create your own with a baguette, meat from a charcuterie and cheese from a fromagerie. (To indicate how much cheese you want, show them with your hands the size of the wedge you would like to purchase.) Cojean, a French sandwich shop with locations all over the city has healthy and delicious to-go food options. You can also pick up ready-made sandwiches and picnic supplies at most grocery stores, particularly larger chains such as Franprix or Monoprix. Although park alcohol policies are not entirely clear in Paris, you often see people sharing bottles of wine while picnicking. DPAM has whimsical play clothes at reasonable prices for kids ranging in age from babies to 10 to 11 year-olds.